If you’re ever in a car collision in Homestead or anywhere in Southern Florida, you’ll likely need immediate help. Whether you need to go to the hospital to get treatment for your injuries or you need to contact your insurer, the process will be much smoother if you have resources. Carrying an emergency kit in your car can help you in the event of a crash and can offer you those resources you need until help arrives. If you’re in an accident at night, a flashlight lets you see the condition of your car and provides you with enough light to see by to place calls. You can get dehydrated if it takes a while for emergency services to get to you—especially if you’re stuck in South Florida heat. A few bottles of water help you stay hydrated. Most people think that in the South Florida heat, no blanket is necessary. But if you’re stuck in your car overnight for any reason, a blanket can be important. If someone at the accident scene is in shock, they can be made more comfortable with a blanket. A blanket can even be used to dress wounds in an emergency. You will probably have this with you, instead of in your car. Just make sure you take your phone with you when you travel and pack extra chargers and make sure your phone is charged up so it’s ready in case you need to make a call after your car breaks down. 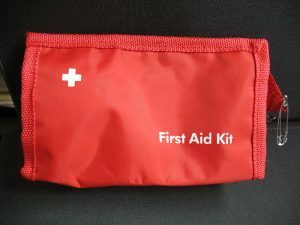 You can buy a pre-made first aid kit or assemble your own using bandages, gauze pads, aspirin, wet wipes, antiseptic ointment, adhesive tape, a list of your medications and doctors, and any medication you may need to take. Look for a fire extinguisher that has been rated by the by the National Fire Protection Association as appropriate for Class B and Class C fires. These are the fires involving electrical fires or flammable materials (such as gasoline) and they are the most likes blazes after a car crash. 8) Flares or reflective markers. If your car breaks down or crashes at night and you can’t move the vehicle to safety, these items let you warn any oncoming drivers about the hazard. Make sure to keep handy information in your car – such as contact information for your doctor, local taxis, local tow trucks, and your insurance information. You may also want to keep the name and number of a personal injury attorney in Homestead or your community. For example, if you have been injured in a crash you can always contact Flaxman Law Group at 954-987-0099 or 305-621-0099 at any time of the day or night for a free consultation and to get immediate assistance.